The magnitude of the mark left by the Kingdom of León on history is difficult to determine. The Kingdom of León served as territorial base for the kingdoms of Castile and Portugal, was a reference point for culture and a pioneer as regards legislation, laying down principles which would be followed in the future. 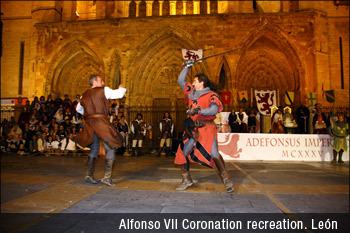 Alfonso IX enacted the first known declaration of rights in the Western world. The legislative endeavours of the Kingdom of León made a significant contribution to the evolution of Democracy as we understand it today. For the first time, the people participated in State decisions, a legislative achievement the influence of which was such that it has survived to the present day in the form of the open councils. In 1188, Alfonso IX’s act of inviting town and city representatives to participate in the Curia alongside the nobility and the clergy gave birth, with the presence of this third stratum of society, to the first democratic “parliament”. Through the Cortes, the rights of the subjects of the Kingdom of León were recognised and assured. The world of culture flourished under the protection of monasteries and councils, producing works of great historical value which have facilitated a deeper understanding of the contexts and conditions of the times. The singular development of the Kingdom of León and other kingdoms in the Iberian Peninsula endowed them with a series of features which distinguished them from other European kingdoms. The Kingdom of León had a Muslim invader at the doors, rendering crusades against the Muslim world a daily occurrence and a question of survival. But war was not the only facet of the Kingdom of León’s relations with Islam: a flourishing cultural exchange “crossed the border daily”, enriching and influencing the evolution of the Kingdom of León and all other Christian Kingdoms in the Iberian Peninsula. The Charter of León consisted of a series of decrees enacted by Alfonso V on the 30th of July, 1017,and included general regulations applicable to the entire Kingdom, and provisions specifically relating to the city of León. It constitutes the first example of a Charter to be drawn up in The Iberian Peninsula, and is considered the first document to declare the fundamental rights of citizens in the history of Europe. The Charter of León was taken as the point of reference when the various other charters were subsequently drawn up. The regulations laid down in the Charter of León are of a very varied nature. They established entitlement to property and possession, regulated market trading and life in the city, protected the trades, guaranteed the inviolability of the home and the immunity of women in the absence of their husbands, and proclaimed the obligation of León citizens to attend the Cathedral chapter held every year on the first day of Lent, to establish measures of bread, wine and meat and stipulate workers’ wages. In addition, inhabitants were exempt from paying war levies to the king, and the king did not have the right to inherit the possessions of those who died without legitimate heirs. Of particular interest is the recognition of the right of serfs to take their goods and chattels with them when abandoning the lands of their overlord, a right that France did not grant until the Revolution in 1789. Another noteworthy feature, in which León was once again a pioneer, was that the Charter established an embryonic council with political and judicial functions. The Charter of León was the most progressive document to be drawn up in the Middle Ages, and its innovative character was such that it continued to prevail throughout the Early Modern Period. It articulated citizen rights that many European countries did not grant until well after the French Revolution. The Cortes constituted the consolidation of certain freedoms, the bases of which had already been established by the Charter of 1017. The Cortes held in León in 1188 laid the foundations of the democracy that we enjoy today. For the first time in the history of Europe, town and city representatives participated on equal terms with the nobility and clergy in important issues affecting the Kingdom. The 1188 Cortes represented the culmination of a process which had been gathering pace over the centuries. Citizens’ fundamental rights had already been established in the Charter of León, and the 1188 Cortes provided the framework within which to ratify and extend the freedoms of the third social stratum. Following the 1188 Cortes, town and city representatives would have a voice and a vote in all important decisions taken by the Kingdom. One aim of the Cortes was to institute judicial procedures guaranteeing transparency and objectivity. There were three especially significant aspects: the quest for peace in the Kingdom through general laws; the presence of commoners in the Cortes; and the monarchy’s use of negotiation. These measures regulated citizens’ individual rights, and provide evidence that admitting the presence of commoners in the Cortes was no mere symbolic act, but rather an indication that the third social stratum had acquired significant influence as regards the various processes. This was reflected in a series of measures, some inherited from the 1017 charter and some new, confirming recognition of the people’s freedom. The measures cited included the prohibition on damaging or stealing the property of others, with heavy punishments for those who committed theft, prohibition on extrajudicial detention, the right to a judicial resolution of disputes and the citizen’s right of appeal to the Court of Assizes or the Liber Tribunal (which applied a modified version of the Liber Iudiciorum, or Visigothic Code) which met in the city of León, in order to claim rights recognised by the local charters of each place. These measures also established the inviolability of the home, demanded respect for the law and forbade false testimony, established the punishment for denial of recourse to the law and regulated the rights and freedoms of women. The King was obliged to consult with the council when taking important decisions, and in turn, the council was required to swear loyalty to the king and maintain peace in the Kingdom. The king had to seek the approval of the Cortes before going to war or declaring peace. The far-reaching legislative endeavour of the 1188 Cortes found continuity in the Constitution determined at the council of Santiago in1194, in the Benaverte Cortes held in 1202, and in the Cortes of 1208, held once again in León. At the Cortes held in 1202 in Benavente, which was the second to be held in European territory, a tax was approved which was an antecedent to the national budget of modern States, the moneda forera (a tax paid to the King in return for which he guaranteed not to devalue the currency). 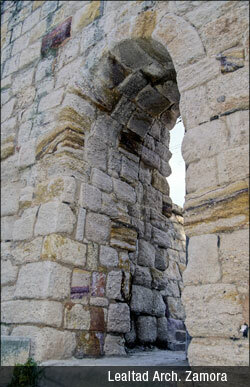 The Church maintained an active role in the political and social life of the Kingdom. Decisions of importance to the Kingdom were made in consultation with the Church, and up to 38 councils were held in the Kingdom of León. The rights acquired by cities and towns were jealously guarded by the people. One of the motives underlying the 1520 Revolt of the Comuneros (communities) was the defence of the judicial system and the Cortes, legacy of the Kingdom of León. Some of the revolt leaders were from León. The Kingdom of León inherited Roman law via a modified version of the Visigothic Code, the Fuero Juzgo. The Fuero Juzgo prevailed over the Castilian customary law, and is the basis of contemporary Spanish law. Saint Fernando III, of León origins, was the first king of Castile and León and he established the brotherhoods and judicial laws of León in the new Kingdom. The Saint James’ Way constituted an economic and commercial impetus, and was also a rich source of cultural exchange. The flow of pilgrims along the Saint James’ Way attracted merchants, the majority of whom were from Frankish territory. 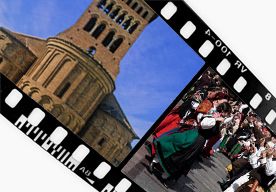 The arrival of people from other parts of Europe brought new ideas to the Kingdom of León, and stimulated cultural growth. Fernando I and Alfonso VI encouraged the establishment of the Cluniac Order in León territory. 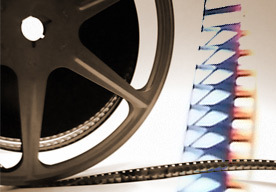 Mediaeval culture was in the hands of the clergy; it was the clergy who cultivated the arts and transmitted knowledge. Cathedral schools enhanced the value of spirituality and trained the clergy. 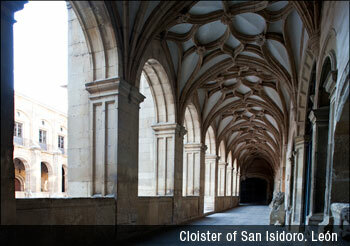 The various monasteries and the cathedrals of León and Astorga and the Basilica of San Isidoro held a large number of books in their archives. The Church in León was very active intellectually, above all in the environs of the Saint James’ Way. The intellectual endeavours of the Church found their highest expression in the Basilica of San Isidoro, a true cultural centre in the 12th century. This collegiate church produced some distinguished authors, including Saint Martin of León and his biographer, Lucas de Tuy, who wrote the Chronicon Mundi. This prolific cultural activity reached its zenith in the second half of the 12th and the first decades of the 13th centuries. Throughout this period, a large number of texts on a surprisingly wide range of subjects within an ecclesiastical context were produced. 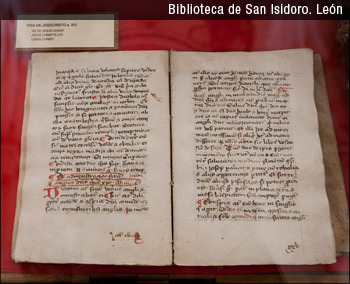 The other important cultural centre was León cathedral, and the cathedral archives still contain some “literary treasures” which have provided an insight into everyday life in the city and the Kingdom. 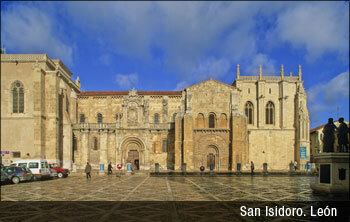 Furthermore, both these cultural centres constitute examples of artistic beauty, in the Romanesque style in the case of San Isidoro and the Gothic style in the case of the cathedral. The importance given to culture in the Kingdom was embodied, in the reign of Alfonso IX, in the creation of the Studium Generale (General School) in 1218. The growing importance of the Studium Generale was rewarded in 1254, when Alfonso X conceded it the title of University, the first of its kind in Spanish territory. The Kingdom of León was a territorial and cultural point of reference. From the León territories emerged the kingdoms of Castile and Portugal, and the Kingdom also constituted the territorial basis of Spain. In the period between establishing the court in Leon, in 910, and the definitive union of León with Castile in 1230, the Kingdom of León was confronted various times with difficult moments but nevertheless was able to grow in the face of adversity to become the dominant kingdom in the Iberian Peninsula. The Kingdom of León withstood attacks from the Muslim world when this latter was at its strongest. And it was during this period that the County of Castile seceded from the Kingdom of León never to be recovered, or at least, not on the same terms. The accession of the house of Navarre to the León throne brought with it the most glorious period in the history of the Kingdom of León, exemplified in the coronation of Alfonso VII as “Imperatur Totius Hispanniae” (Emperor of all the Spains). This predominance was reflected in the arts. Fernando I ordered the construction of the Basilica of San Isidoro to house the saint’s remains, which had been rescued from Seville. Part of the basilica was reserved for the eternal rest of the Kingdom’s monarchs, the Royal Pantheon. 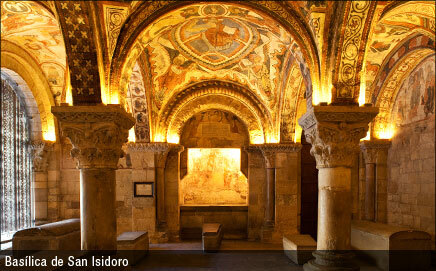 The fresco paintings, the cloisters and the Royal Pantheon itself endowed San Isidoro with a singularity that has led to its being considered a unique example of Romanesque art. Due to the Navarre custom of dividing up territories among the children, on the death of Fernando I, Elvira was given the city of Toro, Urraca received Zamora, Galicia went to García, Sancho was given Castile, and Alfonso, León. Sancho attempted to gain control of the territories held by his siblings, but during the siege he laid to Zamora he was killed by Bellido Dolfos. In Castilian historiography, this act has been considered an act of treason, whilst in León historiography, it was seen as an act of heroism. In fact, the correct historical interpretation would be that Bellido Dolfus was defending his lands from an invader, and was a loyal subject of his legitimate lord. Toledo, an important Muslim stronghold and ancient capital of the Visigoths, was conquered by Alfonso VI, resulting in the consolidation of the Tagus River as the Kingdom’s border and the possibility of future conquests in region of Extremadura. Alfonso VI was the first monarch to mint coins. The accession to the throne of Alfonso VII was the culmination of the Kingdom’s most glorious moments. Alfonso proclaimed himself “Imperatur Totius Hispanniae” on Pentecost in 1135. His coronation was attended by the various kings and lords of the Iberian Peninsula, including leaders of the Muslim territories, and nobles from southern France, who came to pay homage as vassals. It was during this period that the territories of the Kingdom of León served as the basis for the birth of the new kingdom of Portugal, in 1143.